This text was copied from Wikipedia on 21 January 2019 at 6:00AM. During a performance of Henry VIII at the Globe Theatre in 1613, a cannon shot employed for special effects ignited the theatre's thatched roof (and the beams), burning the original Globe building to the ground. Lord Chancellor – More replaces Wolsey, after which time he is never mentioned by name. The play opens with a Prologue (by a figure otherwise unidentified), who stresses that the audience will see a serious play, and appeals to the audience members: "The first and happiest hearers of the town," to "Be sad, as we would make ye." Act I opens with a conversation between the Dukes of Norfolk and Buckingham and Lord Abergavenny. Their speeches express their mutual resentment over the ruthless power and overweening pride of Cardinal Wolsey. Wolsey passes over the stage with his attendants, and expresses his own hostility toward Buckingham. Later Buckingham is arrested on treason charges—Wolsey's doing. The play's second scene introduces King Henry VIII, and shows his reliance on Wolsey as his favourite. Queen Katherine enters to protest about Wolsey's abuse of the tax system for his own purposes; Wolsey defends himself, but when the King revokes the Cardinal's measures, Wolsey spreads a rumour that he himself is responsible for the King's action. Katherine also challenges the arrest of Buckingham, but Wolsey defends the arrest by producing the Duke's Surveyor, the primary accuser. After hearing the Surveyor, the King orders Buckingham's trial to occur. At a banquet thrown by Wolsey, the King and his attendants enter in disguise as masquers. The King dances with Anne Boleyn. Two anonymous Gentlemen open Act II, one giving the other an account of Buckingham's treason trial. Buckingham himself enters in custody after his conviction, and makes his farewells to his followers and to the public. After his exit, the two Gentlemen talk about court gossip, especially Wolsey's hostility toward Katherine. The next scene shows Wolsey beginning to move against the Queen, while the nobles Norfolk and Suffolk look on critically. Wolsey introduces Cardinal Campeius and Gardiner to the King; Campeius has come to serve as a judge in the trial Wolsey is arranging for Katherine. Anne Boleyn is shown conversing with the Old Lady who is her attendant. Anne expresses her sympathy at the Queen's troubles; but then the Lord Chamberlain enters to inform her that the King has made her Marchioness of Pembroke. Once the Lord Chamberlain leaves, the Old Lady jokes about Anne's sudden advancement in the King's favour. A lavishly-staged trial scene portrays Katherine's hearing before the King and his courtiers. Katherine reproaches Wolsey for his machinations against her, and refuses to stay for the proceedings. But the King defends Wolsey, and states that it was his own doubts about the legitimacy of their marriage that led to the trial. Campeius protests that the hearing cannot continue in the Queen's absence, and the King grudgingly adjourns the proceeding. Wolsey and Campeius confront Katherine among her ladies-in-waiting; Katherine makes an emotional protest about her treatment. Norfolk, Suffolk, Surrey, and the Lord Chamberlain are shown plotting against Wolsey. A packet of Wolsey's letters to the Pope have been re-directed to the King; the letters show that Wolsey is playing a double game, opposing Henry's planned divorce from Katherine to the Pope while supporting it to the King. The King shows Wolsey his displeasure, and Wolsey for the first time realises that he has lost Henry's favour. The noblemen mock Wolsey, and the Cardinal sends his follower Cromwell away so that Cromwell will not be brought down in Wolsey's fall from grace. The two Gentlemen return to observe and comment upon the lavish procession for Anne Boleyn's coronation as Queen, which passes over the stage in their presence. Afterward they are joined by a third Gentleman, who updates them on more court gossip – the rise of Thomas Cromwell in royal favour, and plots against Cranmer, the Archbishop of Canterbury. Katherine is shown, ill; she has a vision of dancing spirits. Caputius visits her; Katherine expresses her continuing loyalty to the King despite their divorce, and wishes the new Queen well. The King summons a nervous Cranmer to his presence, and expresses his support; later, when Cranmer is shown disrespect by the King's Council, Henry reproves them and displays his favour of the churchman. Anne Boleyn gives birth to a daughter, the future Queen Elizabeth. In the play's closing scenes, the Porter and his Man complain about trying to control the massive and enthusiastic crowds that attend the infant Elizabeth's christening; another lush procession is followed by a prediction of the glories of the new born princess's future reign and that of her successor. The Epilogue, acknowledging that the play is unlikely to please everyone, asks nonetheless for the audience's approval. As usual in his history plays, Shakespeare relied primarily on Raphael Holinshed's Chronicles to achieve his dramatic ends and to accommodate official sensitivities over the materials involved. Shakespeare not only telescoped events that occurred over a span of two decades, but jumbled their actual order. The play implies, without stating it directly, that the treason charges against the Duke of Buckingham were false and trumped up; and it maintains a comparable ambiguity about other sensitive issues. The disgrace and beheading of Anne Boleyn (here spelled Bullen) is carefully avoided, and no indication of the succeeding four wives of Henry VIII can be found in the play. However, Catherine of Aragon's plea to Henry before the Legatine Court seems to have been taken straight from historical record. Most modern scholars date Henry VIII to 1613, the year in which the Globe Theatre burned down during one of the play's earliest known performances. One contemporary report states that the play was new at the time of the fire, having "been acted not passing 2 or 3 times before". Despite this evidence, there has been much debate about the date of the work. Nicholas Rowe in 1709 wrote that the play must date from after the death of Elizabeth in 1603 because its "E[u]logy upon Q. Elizabeth, and her Successor K. James, in the latter end of his Henry VIII, is a Proof of that Play's being written after the Accession of the latter of those two Princes to the Crown of England". Rowe was writing before the discovery of the document on the 1613 fire, which was first published by the 18th century scholar Thomas Tyrwhitt and seemed to confirm his view. However, several 18th- and 19th-century scholars, including Samuel Johnson, Lewis Theobald, George Steevens, Edmond Malone, and James Halliwell-Phillipps, dated the play's composition to before 1603. Malone suggested that the brief passage in praise of James was probably added for a performance during his reign but that the extended glorification of Elizabeth implies that it was intended for her ears. James "hated her memory", so such praise was not likely to have been written under him. Malone mistook the 12 Feb 1604 Stationer's Register entry of "the Enterlude of K. Henry VIII" (Samuel Rowley's When You See Me You Know Me, 1605) as Shakespeare's play, and he argued that the reference to the newness of the play in 1613 derived from the fact that it had been expanded with a new prologue and epilogue, perhaps written by Ben Jonson. 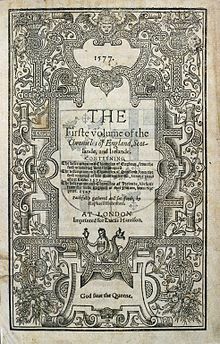 In fact, Shakespeare's play was first registered on 8 November 1623, along with 15 other previously unpublished works, in preparation for the publication of the 1623 First Folio. Halliwell-Phillipps also took the view that the play performed in 1613 was an altogether different work. These views are no longer held by most modern scholars. Plays offering positive portrayals of major Tudor figures like Henry VIII (When You See Me You Know Me) and Queen Elizabeth (If You Know Not Me, You Know Nobody, 1605) were in fact performed, published, and re-published throughout the Stuart era. Since the play is now generally believed to be one of Shakespeare's collaborations with John Fletcher, the 1613 date is consistent with other such collaborations. The play was published as the work of Shakespeare, and was accepted as such by scholars until 1850, when the possibility of collaboration with John Fletcher was first raised by James Spedding, an expert on Francis Bacon. Fletcher was the writer who replaced Shakespeare as the principal playwright of the King's Men. He is known to have collaborated with Shakespeare on other plays, but there is no contemporary evidence of it for this play; the evidence lies in the style of the verse, which in some scenes appears closer to Fletcher's typical style than Shakespeare's. It is also not known whether Fletcher's involvement can be characterised as collaboration or revision, though the apparent division of scenes between the writers strongly suggests the former. Spedding and other early commentators relied on a range of distinctive features in Fletcher's style and language preferences, which they saw in the Shakespearean play. For the next century the question of dual authorship was controversial, with more evidence accumulating in favour of the collaborative hypothesis. In 1966, Erdman and Fogel could write that "today a majority of scholars accept the theory of Fletcher's partial authorship, though a sturdy minority deny it." An influential stylistic or stylometric study was undertaken by Cyrus Hoy, who in 1962 divided the play between Shakespeare and Fletcher based on their distinctive word choices, for example Fletcher's uses of ye for you and 'em for them. In the mid-nineteenth century, James Spedding had proposed a similar division based on the use of eleven-syllable lines; he arrived at the same conclusions Hoy would reach a century later. The Spedding-Hoy division is generally accepted, although subsequent studies have questioned some of its details. Shakespeare: Act I, scenes i and ii; II,iii and iv; III,ii, lines 1–203 (to exit of King); V,i. Fletcher: Prologue; I,iii; II,i and ii; III,i, and ii, 203–458 (after exit of King); IV,i and ii; V ii–v; Epilogue. Henry VIII is believed to have been first performed as part of the ceremonies celebrating the marriage of Princess Elizabeth in 1612–1613, although the first recorded performance was on 29 June 1613. The performance is especially noteworthy because of the fire that destroyed the Globe Theatre during the performance, as described in several contemporary documents. These confirm that the fire took place on that date. One often reported tradition associated with the play involves John Downes, promptor of the Duke of York's Company from 1662 to 1706. 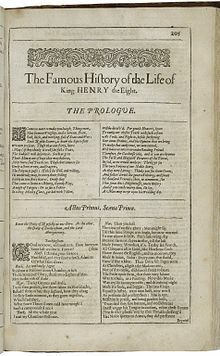 In his Roscius Anglicanus (1708), Downes claims that the role of Henry VIII in this play was originally performed by John Lowin, who "had his instructions from Mr. Shakespeare himself." During the Restoration era, Sir William Davenant staged a production, starring Thomas Betterton, that was seen by Pepys. Thomas Betterton played Henry in 1664, and Colley Cibber revived it frequently in the 1720s. Subsequent stagings of the play by David Garrick, Charles Kean, Henry Irving (who chose to play Wolsey, the villain and perhaps the showier role of the play, in 1888, with Ellen Terry as the noble Katherine of Aragon). The longest Broadway run the play has had is Herbert Beerbohm Tree's 1916 production in which Lyn Harding played Henry and Tree played Wolsey, running 63 performances. Tree's production was notable for its elaborate exploitation of the play's pageantry, typical of the expensive and spectacular staging of the era. The production subsequently toured, with Sydney Greenstreet taking over the title role. The play's popularity has waned in the mid twentieth century, although Charles Laughton played Henry at Sadler's Wells Theatre in 1933 and Margaret Webster directed it as the inaugural production of her American Repertory Company on Broadway in 1946 with Walter Hampden as Wolsey and Eva Le Gallienne as Katherine. John Gielgud played Wolsey, Harry Andrews the king and Edith Evans Katharine at Stratford in 1959. Another notable production was the first at the reconstructed Shakespeare's Globe from 15 May to 21 August 2010, as part of the theatre's first season of Shakespeare's history plays, with cannon fire at the same point as the 1613 production and a cast including Dominic Rowan as Henry, Miranda Raison as Anne, Ian McNeice as Wolsey and Kate Duchêne as Katherine (with Raison also playing Anne in the same season's Anne Boleyn). It was staged at the Folger Shakespeare Theatre (Washington, D.C.) from 12 October until 28 November 2010; this production added a puppeter-narrator, played by Louis Butelli, named for Henry VIII's jester, Will Sommers, as well as the character of Mary I, played by Megan Steigerwald. A remount of that production also played at Alabama Shakespeare Festival in 2012. In July 2013, the Hudson Shakespeare Company of New Jersey mounted a production as part of their annual Shakespeare in the Parks series. While director Jon Ciccarelli set the production in the Tudor period, he adapted the script to provide a more modern spin to the wives by fleshing out the role of Anne Bullen and stressing the plight of Queen Katherine of Aragon. Katherine (Noelle Fair) spoke the play's prologue and Anne (Emily Ludolph) spoke the epilogue, having the wives bookend the play. In the original play text, Anne is presented as a passive, almost divine figure that great events happen around and she and Katherine never meet. Here, she was given more lines, some usually spoke by a gentleman commenting on the Buckingham execution to give the character more of a presence in the show. The production also introduced several dumb shows, set to period music, showing the development of Henry and Anne's relationship and his distancing from Katherine. 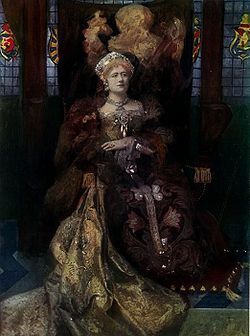 Anne was made one of Katherine's waiting women that led to a minor but tense stand off scene as a song usually given to a minor character was sung by Anne in front of the enraged Queen Katherine. ^ "Henry VIII: Entire Play". shakespeare.mit.edu. ^ G. Blakemore Evans, general editor, The Riverside Shakespeare, Boston, Houghton Mifflin, 1974; p. 977. ^ a b Gordon McMullan, ed. Henry VIII (London: Thomson, 2000), pp. 57–60. ^ Nicholas Rowe, "Some Account of the Life &c. of Mr. William Shakespear", 1709. ^ Edmond Malone, The Plays of William Shakspeare, vol 2, 1790, p.150 ff. ^ James Halliwell-Phillipps, The Works of William Shakespeare, Collier, p.167. ^ Chambers, Vol. 3, pp. 342, 472. ^ Spedding, James. "Who Wrote Henry VIII?" Gentleman's Magazine, 178 / new series 34, August 1850, pp. 115–23. ^ Erdman, David V., and Ephraim G. Fogel, eds. Evidence for Authorship: Essays on Problems of Attribution. Ithaca, N.Y., Cornell University Press, 1966; p. 457. For a summary of scholarship to that date, see: pp. 457–78. ^ Hoy, Cyrus. "The Shares of Fletcher and his Collaborators in the Beaumont and Fletcher Canon." Studies in Bibliography 15 (1962); pp. 71–90. ^ John M. Berdan and Tucker Brooke, The Life of King Henry the Eighth (Yale UP, 1925), pp. 155–57. ^ Hope, Jonathan. The Authorship of Shakespeare's Plays. (CUP, 1994) pp. 67–83. ^ Erdman and Fogel, p. 457. ^ Downes' Roscius Anglicanus is an important source of information on the Restoration stage and the traditions it preserved from the early Stuart era. Halliday, p. 140. ^ Halliday, F. E. A Shakespeare Companion 1564–1964, Baltimore, Penguin, 1964; pp. 74–5. ^ Masters, Tim (2010-05-14). "Why Shakespeare's Henry VIII remains a rarity". BBC News. Retrieved August 20, 2016. ^ "'Henry VIII' visits Kenilworth July 18". The Cranford Chronicle. July 8, 2013. Gordon McMullan, ed. King Henry VIII. The Arden Shakespeare. London: Thomson, 2000. Kirwan, Peter (2010-06-09). "Review: Henry VIII @ Shakespeare's Globe". The Bardathon (Blog). "Calling at Wotton’s, my shoemaker’s, today, he tells me ... that Harris is come to the Duke’s house again; and of a rare play to be acted this week of Sir William Davenant’s: the story of Henry the Eighth with all his wives." Davenant revived Shakespeare's Henry VIII at the Duke's House Theatre, Lincoln's Inn Fields. There is no evidence of Davenant altering this particular play, although he usually did because he did not own the copyright to the originals. Henry VIII was first performed in 1613, and appeared in print in 1623. Downes (p.24) describes this revival as a great success and that Thomas Patrick Betterton played Henry VIII, 'he being instructed in it by Sir William (Davenant), who had had it from Old Mr. Lowen, that had his Instructions from Mr. Shakespeare himself ....' [Henry or Joseph] Harris appeared as Wolsey, and Betterton's wife, Mary Saunderson, was Queen Katherine.